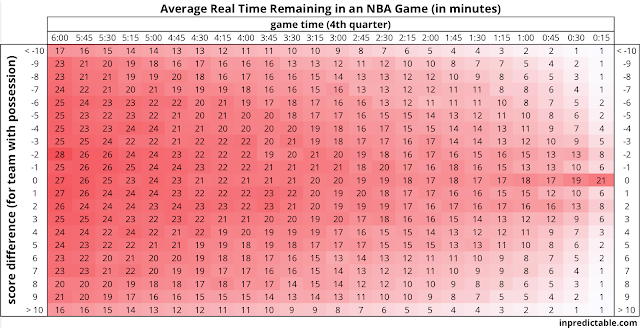 Home / game length / NBA / How Much Actual Time is Left in the Game? Close games in the NBA can somewhat of a mixed blessing. As the drama increases, the pace tends to drag, as teams call timeouts to draw up set plays, players are fouled to stop the clock, and officials await decisions from the NBA's centralized review office in New Jersey. 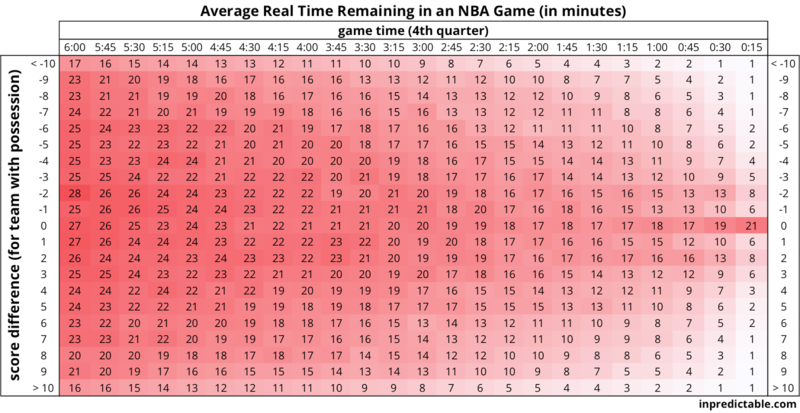 On average, the final minute of an NBA game takes over 5 minutes of real time to complete, and that number gets much larger if the game is close. 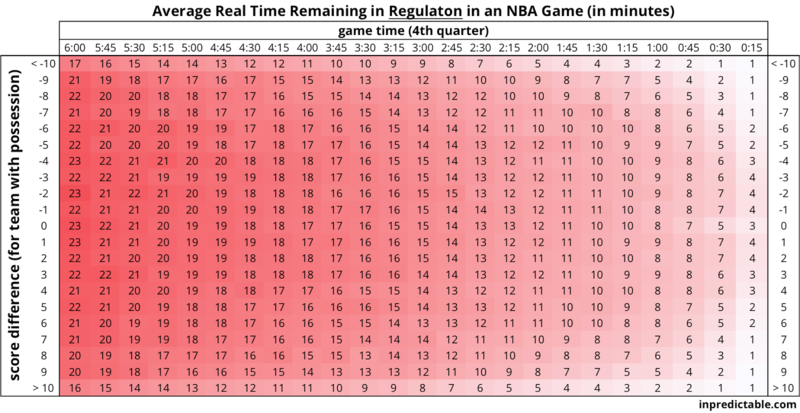 Here are some cheat sheets I put together that give you a sense as to how much real time is left in an NBA game, as a function of scoring margin and game time remaining. I had hoped to build a real time view of this into my live win probability graphs, but that will likely have to wait for the offseason. The first chart shows how much total time is left in the game. Note that this includes any overtime play, which is why the time remaining is so large for tie games in the final minute. 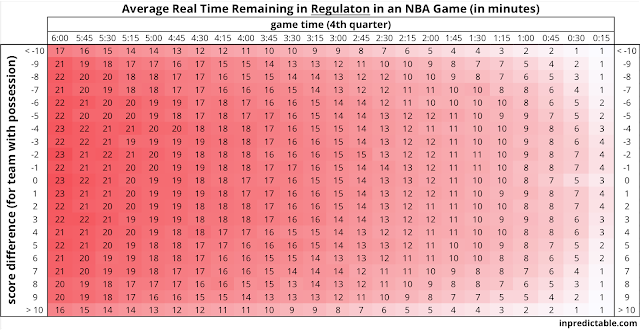 What about just time left in regulation? Note that the time remaining for a tie game is now less than that for a game separated by a point, most likely due to teams holding for the last possession in a tie game. It appears that if the game is in reach going into the final minute (i.e. within 6 points), that last minute takes about 8 to 9 minutes to complete on average. 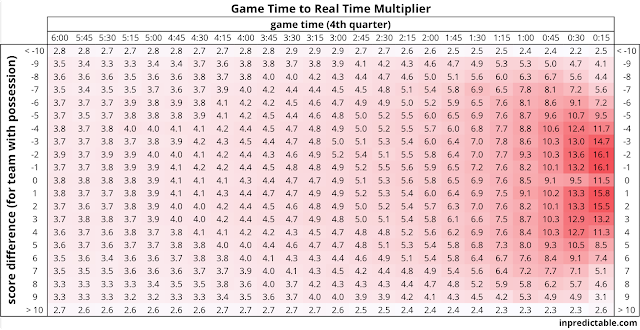 The final chart shows how that "multiplier effect" works as a function of time remaining and score difference. The highest multiplier occurs when a team is trailing by 1 or 2 points, with possession, and with 15 seconds remaining in the game. Those 15 seconds of game time are multiplied 16 times over in real time.